TAN membership is open to all who share our vision, mission and values irrespective of race, ethnicity, gender or political affiliation. When you become a member of TAN, you join a global network of entrepreneurs and aspiring entrepreneurs who are dedicated to developing and supporting entrepreneurship and technology among all people of African descent globally. Access to Networking, Educational, and Mentoring resources that foster entrepreneurial development. Attendance of TAN’s Monthly Networking Meetings. Discounts on all Special TAN Events including TANCon Access to the TAN intranet. Free subscription to TAN’s Quarterly Newsletter. Access to all TAN affiliate events at discounted rates and much more. Charter Membership is open to accomplished entrepreneurs, business and academic leaders whose accomplishments resonate with TAN’s mission. Charter Membership is typically by invitation from TAN’s Board. 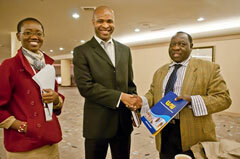 Persons interested in becoming charter members should contact membership@theafricannetwork.org. General membership is open to all with the aforementioned benefits. Annual dues are $150. Student membership is open exclusively to students who are enrolled in FULL or PART-TIME programs at academic institutions working towards a degree. Benefits include all the aforementioned except voting rights. Annual dues are $75.